Atrial myxoma is the most common benign (noncancerous) tumor of the heart. It often grows out of the wall that separates the right and left atrium. Atrial myxoma can cause serious symptoms such as strokes and heart attacks when fragments of tumor break off and travel to the heart or the brain. If the tumor is large and mobile, it can cause heart malfunctions by clogging the heart valves. An atrial myxoma needs to be removed surgically as soon as possible to avoid irreversible damage to the heart, the brain or other distant organs that can be affected by the tumor. Women are affected by atrial myxoma three times more often than men and they are commonly diagnosed at a fairly young age. Most women are glad to find out that their atrial myxoma surgery can be performed with a minimally invasive approach that will hide the surgical scar out of sight, in the skin fold underneath the right breast. There are no medications or drugs that can treat cardiac myxomas. The recommended therapy is a surgical removal as soon as possible to prevent any complications. I still have to meet a patient who is sincerely thrilled with the prospect of an open-heart operation but I do have great news on this subject. All atrial myxomas, regardless of size or shape, can be safely and accurately removed with minimally invasive techniques. The surgery does not leave any visible scar and it allows a quick and uneventful recovery. It has the great advantage of much less bleeding, pain, or chance of infection than the traditional breastbone splitting operation. Most patients can be discharged home two days after surgery. Echocardiograms are the best way to quickly confirm the diagnosis and see the location of an atrial myxoma. 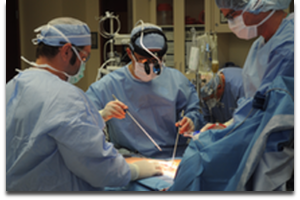 There are several diagnostic tests used to confirm and give your heart surgeon a roadmap for tumor removal. Transthoracic Echocardiogram (TTE) is a noninvasive, painless imaging study that uses ultrasound waves to show the size and location of the cardiac myxoma within the heart. Transesophageal Echocardiogram (TEE) uses the same ultrasound technology of the TTE but this time the probe is passed through the esophagus into the stomach for a closer look and sharper details of the heart structures. Genetic testing may be appropriate if suspicion of Carney complex is raised. Electrocardiograms (EKG) can be very nonspecific. It might occasionally show evidence of enlargement of the left atrial chamber and signs of pulmonary hypertension. Left Heart Catheterization (also known as Coronary Angiogram) is obtained as part of our preoperative evaluation in all patients over the age of 45 or any patients with a history or high suspicion of coronary disease, regardless of age. This test will tell us if any coronary disease is present and whether or not it will require a bypass grafting at the time the myxoma is removed. If you or a loved one is suffering from an atrial myxoma, do not delay! Call Dr. Ciuffo and his staff of minimally invasive experts to schedule a consultation with him and discuss your options. Call us at (330) 363-1341 or contact us online with any questions.